Sometimes I have enough to say about a book to warrant a full review, and other times I don't but I still want to share my thoughts somehow. I've been reading a lot of graphic novels recently, and while I've enjoyed the majority of them I haven't found much to say individually about all of the ones I've read. So today I'm going to do three mini-reviews for three graphic novels I've recently read! I knew absolutely nothing about this graphic novel until it was recommended to me on Amazon, described as a story about a single mother who moves her and her son to a new planet to work as a sheriff there and deal with everything from alien hillbillies to a local massacre. I really enjoyed it; it was a lot of fun, I liked the art style and I liked the world. If you're a fan of aliens and cowboys, or a fan of female-led sci-fi, then I'd recommend checking this one out. I'm hoping there'll be another volume out later this year! I read American Vampire, Vol.1 last year after finding it in my local library. Check out my review here! I wasn't sure if I was going to carry on with the American Vampire series at first, until I realised the fact that it kept popping into my head despite having read the first volume back in October had to be a sign that it was time to track down Volume 2. Sadly Volume 1 was the only one my library had, so I used trusty old Abebooks and found a couple of secondhand copies of Volume 2 and Volume 3 in really good condition. 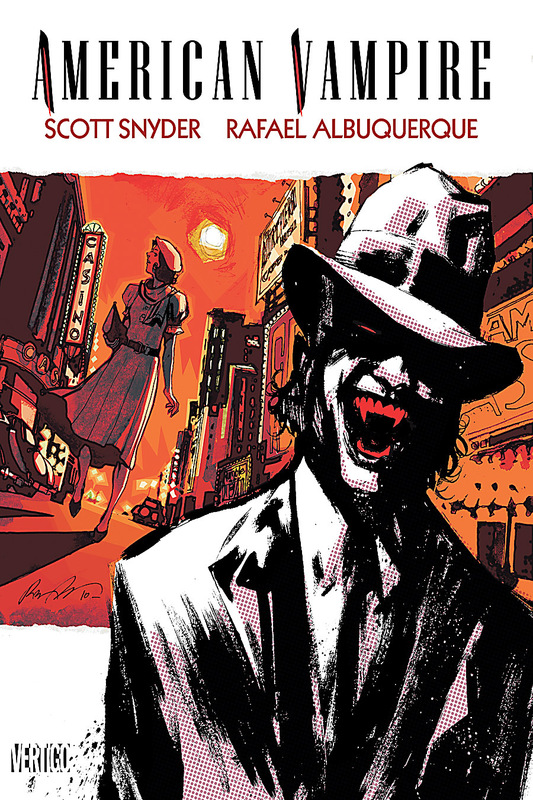 I really enjoyed being back in the world of American Vampire; it's easy for me to get bored by vampires, but I think Scott Snyder's created something really different with this series, and that's special. I'm definitely going to be continuing with this one. Wow, we couldn't be farther apart on Fables! I absolutely love this series, and I'm just waiting for the next volume to be released. The first volume is really just setting the stage, more or less, and as I recall, it was somewhere around vol. 3 or 4 that I went from enjoying to loving. :) I'm with you on Bigby Wolf -- I have a very weird crush on him.